I wanted something cinnamony for our Christmas Brunch (the invented word is pronounced: sin-uh-money; not to worry, cinnamony has nothing to do with sin or money, it’s all about the smell and taste of Christmas). I also wanted to use my homemade vanilla. 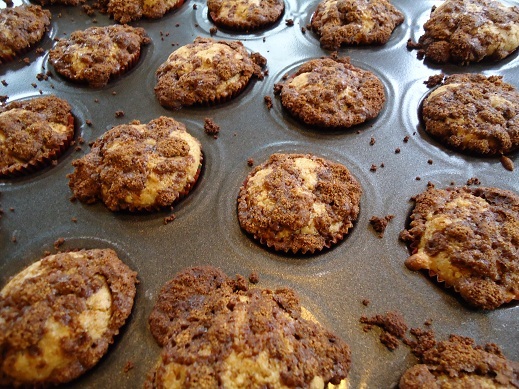 So I played just a little bit and came up with Vanilla Muffins with Cinnamon Crumb Topping. I made mine with a mini muffin tin, but you can use a regular sized muffin tin instead if you prefer. Stir together flour, sucanat, baking powder and sea salt. Add egg, vanilla, butter and milk. Mix until ingredients are combined. Scoop into paper lined muffin tins. (24 mini muffins or 12 regular sized muffins) Mix together Cinnamon Crumb Topping ingredients and sprinkle on top of each muffin. Bake in a 400° oven for 15 minutes (mini muffins) or 20 minutes (regular sized muffins). 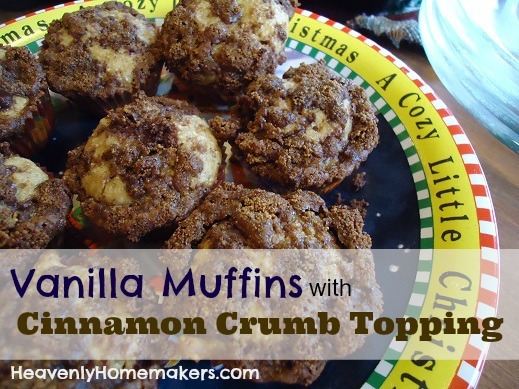 These Vanilla Muffins with Cinnamon Crumb Topping go perfectly with Easy Breakfast Casserole. I also think the cinnamony-ness would taste great with Warm Vanilla Soother. Up next during our Christmas Brunch: a great giveaway from Tropical Traditions. Then, to add to our cinnamony pleasure…Gingerbread Cookies. Not only are they cinnamony…they’re gingerlicious. And full of molassessness. You never knew our Christmas Brunch would be so full of new vocabulary words did you? Looks yummy! Thanks for sharing this. Finishing off my homemade vanilla tonight!! So excited to give it away as gifts and to start using it!!!! They look so good! I can’t wait to try this recipe. These look great!! I’m going to get some mini tins and make them, the mini ones look cute! Thank you for the recipes, they look scrumdiddlyumptious! Gotta love muffins with a good crunch! These look yummy! We do a Christmas Day Brunch with all of the Grandparents and I may just have to make these! I’m already making a breakfast cassarole similar to yours (mine uses bread for the ‘crust’ and sausage!). Oh my goodness, those look YUMMY! Oh those look so so so nice!!!!! This is shaping up to be one tasty brunch, thanks Laura! Wow – I’ll take two!! Thanks for all the giveaway chances. YUM Laura! I can’t wait to make these! I was waiting for you to post this recipe after you teased us with it the other day! I love the new words! I think I need to make these with a warm vanilla soother tomorrow. I just happen to have egg yolks leftover from making macaroons! :) It’ll be vanilla-licious! We made your homemade vanilla in August and started using it just this month. We love it! And I can’t wait to try these muffins! Would love to try making the homemade vanilla sometime. This sounds delicious! We have got to try it. Also, I followed your link on sucanat. We’ll need to pick some up at the store next time to give it a try too. These look AMAZING and I will be happily serving my family these on Christmas morning too! These look wonderful AND I just picked up several mini muffin tins at the thrift store yesterday! Does this end up tasing a bit like a coffee cake? IF so, my hubby would love it. I may have to bookmark it. Yes, it does a little bit! Mmm-mmm-mmm!! These sound so good! Would love to try these. The cinnamony top looks delicious. These look so yummy! We’re going to have to try them. Thanks for the recipe. I just got a mini-muffin pan, I think I’ll try them! Cinnamon is my absolute favorite flavor and fragrance. What a yummy sounding recipe! Can’t wait to try it. Will be trying these for breakfast soon! Oh wow, I might have to give these a try tomorrow. They sound wonderful! They sound kinda like coffee cake or streusel kuchen. These sound delicious. My mother-in-law loves muffins for breakfast. She just came into town today. I will have to make these for her. Thanks for the recipe. I might be tempted to make these instead of cinnamon rolls for Christmas Eve breakfast! Yum!!!! YUM!!! I was just looking for something cinnamony the other day. I tried your chocolate swirl muffins and instead of cocoa I put in some cinnamon. Good, but not as good as these look!!! Can’t wait for the smell and of course to taste one!!! Yay! I’ve been waiting for you to post this recipe! Thanks!! A few hours earlier in posting this and I would’ve made it for my daughter’s 1st birthday!! She got banana bread instead. :) Looks awesome!! thanks, can’t wait to try these!! Well, I don’t have any homemade vanilla extract, but I’m definitely going to try these with store-bought vanilla soon. Maybe tomorrow morning…yum! These will be great at a New Year’s brunch we’re hosting. Yummy! These look so good I can almost smell them! I think I will try these this weekend. I’ve been just waiting fro you to post the recipe. They look wonderful and DH says I am making him hungry! These look wonderful and easy to make. Might have to make them before Christmas!! Yum, yum, yum! I can’t wait to make these! Wow. You have such incredible looking recipes. And I love your blog, by the way. I always look forward to getting a new post in my email. I will definitely be trying these muffins.. I think for New Years. One word – YUMMY!!!!!!!!!!!!! Thank you for sharing such awesome recipes with all of us! I can smell them. Right now, in my kitchen, I can smell them….. I’m sure of it! These look so incredible! I will be making them this weekend! Yum, yum, yum! Will definitely be trying these. I have been anxiously awaiting this recipe. I made homemade vanilla with you this year (thank you, and yes, we had a great time!) so this will be the first time I try it in a recipe. Thank you! OH, do I ever love you!! I am too brainless to come up with my own recipe. Thanks for sharing. Will be trying these soon!! These muffins sound absolutely delicious!! Thanks for the recipe! Thank you for this! We eat lots of muffins around here, and it is nice to have recipes with pantry staples. I can’t wait to make these muffins later today. They look and sound delicious. Headed to the kitchen to make these muffins. Can’t wait for the ginerbread recipe. I bought a jar of molasses the other week for a recipe that called for 1 tbsp. So needless to say I still have a jar of molasses to use up. Any recipes? I’m leaving the computer right now to go make these muff….. These sound delicious and so easy. off to make these now! Hooray! This is the recipe I was waiting for! So many yummy things to consider for Christmas morning! Wow, those sound amazing!! Can’t wait to try them! I am always looking for new muffin recipes. Thanks for sharing! yes, I will be making these! Yum! Thanks for the recipe. Can’t wait to try them! The picture is absolutely beautiful! They sound amazing as well. Thanks for always making cooking so appealing and fun! I’m making these this morning!! Thanks for the recipe! My kids love muffins and I’m always on the lookout for new kinds to try. i can’t wait to make these! they look like cinnamon-y perfection! Mmm…what would happen if I left out the egg die to allergies? Ill have to find out, because these look TOO good to pass up!! These look simple and very delish–love it! these look great, I might have to add them to my Christmas morning menu! I love seeing your new recipes…it makes me wish we were staying home for Christmas so we can have our own traditions! However, we are so THANKFUL that we have family to visit and keep their traditions alive. I will these for our lazy mornings during the rest of the winter. Can you say yum, yum, yum! Can’t wait to try these muffins, they look awesome! Am Definitely going to make these. This recipe looks like another winner! Looking forward to trying these. Thank you for the recipe. I’m enjoying the brunch. Haven’t tried sucanat yet, but after reading about it here so often I’m going to be on the look out for it. I’m sure they have it at our co-op. love this topping. I might try it on some cookies. I love the new words! Especially gingerlicious!! Yay! I was so looking forward to these! They look so good!! Yummmmmmy! My kids don’t get super excited over muffins unless they have a crumb topping. These look delicious! Thanks for the new recipe!! These look so good! I may have to try these for Christmas morning. These look so good! I can almost smell the cinamony-ness! Thanks! Laura, this recipe sounds marvelous. And it looks so yummy. yummy – you are pushing me into this succatant thing. I’m not trying to cheat and enter again. I’ve already posted to this post (so only count me once), but I forgot to ask a question. Do you use hard white wheat or soft white wheat in your muffin recipes? Thanks! Love the new vocabulary words! This recipe sounds a lot like one I have for a coffee cake… but I’ve never made it as muffins. I’ll have to try this even though I didnt make my own vanilla. Thanks for sharing it with us! Looking forward to the gingerbread recipe, I need one more cookie to bake for Saturday! Thank you. These look great, can’t wait to try them sometime! These look really yummy and I am sure my family will love them. I am wondering however, you said you used your homemade vanilla in the recipe. When the recipe says to use 1 tsp. is that of the homemade or do we use only 1/2 homemade vanilla? They look delicious – I can’t wait to try them! Oh! These look absolutely YUMMY! These look so good. I’m at work now and really wish I was home so I could whip these up real quick!! These sound so delicious…and look it too. We love cinnamony things around here! These look fabulous! I may have to convince my mom to add these to our baking list for Christmas. I am sure my kids and husband will love them. One question, I am sure my mom doesn’t have sucanant in her kitchen. Would brown sugar work? From what experimenting I’ve done with some of Laura’s other recipes, you could use either brown or white sugar as a replacement for sucanat. It all depends on the intended use. In this case, I’d probably use white for the muffins and brown for the crumb topping. HTH! These look really good! I don’t have sucanat, but I have evaporated cane sugar. Is that the same thing? Yea! I’ve been waiting for this recipe! Sounds like another good recipe to try! YUM!!!!!! My family will love these! Thank you! I can’t wait to make these! They look fabulous!…I am with others, I am going to have to look into the sucanat…you are a true inspiration! Seriously, these all look so great! um YUM! Thanks for sharing this recipe! These look great. Do you think it would be okay to bake in a loaf pan instead of muffins? These look soooo yummy!! I was wondering, though, if the coconut oil imparts a coconut flave to these muffins? Not that I would mind, but some of my extended family members might. I want to make these muffins soon! We eat a lot of muffins and I’m always on the prowl for a new recipe. Thanks for this one! Thanks so much! I’m about to head in the kitchen to make some now! Might make extras to take tomorrow to work! These look sooo yummy – can’t wait to make these! yum yum, those look amazing. These look great. Do you know if there is a way to make them soaked? Do you think I could soak the flour in the milk with a tablespoon of yogurt? My kids (3 and 6) love muffins so we will have to try these! Can’t wait to make thiese muffins. I think I’ll soak the flour in the milk with a little yogurt and see how they turn out. We’re making these right now. Smells yummy. This sounds like a WONDERFUL muffin recipe. Will be trying soon! I made these this morning and they were Wonderful! Thank you! Oh yummy! I think we will need to make these just as soon as my mother has opened her box with homemade vanilla in it! They sound yummy! Thank you. This recipe does sound good. Thanks for sharing! The muffins look delicous! they would definately go well with the vanilla soother. Yum! Can’t go wrong with cinnamon! Ok, these sounds delicious, I’m always looking for new yummy muffin recipes. I love new words…especially ones that involve yummy tasting things! Definitely trying these! Mouth is watering. My family is so lucky that I read your blog and like to bake. We’ll be enjoying these over the holidays. Do we cut the vanilla amount in half if we’re using homemade vanilla? Those look soooo yummy! Yet another one of your recipes I’m definitely going to have to try! I’m trying these soon! Thanks for such great recipes! I think I’ll be making these this morning. The kids will love waking up to that smell. Note to self: Never read Laura’s posts before breakfast. Because then you will not want what you have in the fridge already, you will want to make her yummy recipes. But that will take too long and you are already hungry. Then you will be frustrated and try to lick the computer screen. And that would be gross. Love, Self. I will definitely be trying these sometime this holiday season. Thank you for your recipes. We love muffins in our house so this will be a great addition! I am for sure making these! Mmmmm… you house must smell so good right now! Another recipe I can’t wait to try! These look really yummy… and it looks like it shouldn’t be too hard to soak the flour ahead of time! I’m making these and your Copy Cat Cinnabon cinnamon rolls tonight and tomorrow morning. I’ve never had vanilla muffins before, but these look really good! I’m sad that we are overflowing with english muffins right now – these look amazing! I tried these tonight and the topping melted and slid off the muffins onto the muffin tin. Any suggestions as to what I did wrong? I went the brown sugar route – I wonder if that had something to do with it. I have these muffins cooking in our oven right now! They smell great! Thanks for this recipe! I was wondering what kind of baking powder you use? I never knew it had aluminum in it! I usually use Rumford baking powder, but you can find others without aluminum…the aluminum free baking powders always specify! Crazy that aluminum is added to so many others! About to put some in the oven. For me, it’s making nine regular-sized muffins. Can’t wait to try them! Making these right now, with some chopped apples stirred in the batter. They smell delicious! Oh my goodness! I just made these and they are absolutely delightful!! I just couldn’t wait for the first batch to get done in order to use my muffin tin again, so I made my second batch into a loaf of bread. It is divine! Thanks for sharing your recipe. Also, my topping was sprinkleable( new word :) ) but that ooey gooey mixture that I somehow made was terrific. Have a blessed day! I have to post and say that I make these muffins weekly! They have made us a muffin family and it is expected by husband and two babies that these muffins are in the oven Saturday mornings and boy do they go fast! These were excellent! My husband requested that the next I make these to use our organic all purpose flour instead of the whole wheat flour. He still liked them though. My only problem was though that my muffin mixture didn’t go far enough. I have a jumbo muffin pan and it didn’t fill all six like it usually does on the blueberry muffins. Hmmm.. They were still VERY yummy though! Thanks for the recipe! I made these the other day. I added chocolate chips and left off the crumb topping. My kids call them chocolate chip cookie muffins! They were a big hit and some friends (children) said they were the best muffins they ever had! We love trying lots of your recipes! Can I use regular white flour instead? I don’t have my wheat grinder yet. I’ve been looking for a basic vanilla muffin for so long, and the recipes I saw always had TONS of sugar. I made these today, and they’re exactly what I’ve been wanting! Thank you! The kids love them, of course, and they’re very filling. I like how dense and satisfying they are. Very nice rounded shape, too — they don’t just ooze into flat tops. I am going to need a bigger freezer Laura. Thank you for all your wonderful recipes. I was looking through and copying down some of your recipes to try some more of them when it dawned on me, your recipes never have a ton of ingredients and usually only a small paragraph about how to mix and cook them. No wonder I am always drawn back to your site!! I love that everything is sooooooo simple! Thank you so much and have a Jesus-filled weekend!! !